I bought my 2005 330ci ZHP (build date of 8/2005) in August 2010. It was dang clean -- from engine to interior. The previous owner did a great job of regularly changing the oil and other fluids. The previous owner bought the car new and paid cash (about $45,000). I was also a cash buyer, so this car has never seen a lien on its title. The car was equipped with leather seats (natural brown), leather M steering wheel, black cube trim, and factory navigation system. It needed work (see my maintenance page). Alcantra seats (9/10), leather steering wheel (6/10 - re-wrapped with a wheelskinz - and I'm happy with it), no style 135's (0/10 - Threw my Enkei's on eeet), no ///M shift knob (0/10 - replaced), body (6/10 - swirls - I am in the process of paint correcting the entire car). With all that said.....I love my car. DO I wish it was in better condition when I bought it? Maybe. Last edited by danewilson77; 12-07-2010 at 04:53 PM. 45,000 miles, alcantara, silver cube, leather///M steering wheel, nav, cold weather package, xenons, HK sound, spotless in and out (no dents, dings, or scratches) bottom of front bumper does need clear coat. CPO Warranty until September 2011. Sticker was $24,000. I definitely paid a lot, but at the end of the day it was the exact car I wanted and I was willing to take it in the shorts a little to get it. Last edited by kayger12; 12-08-2010 at 05:52 PM. This reminds me. Tell us where you bought it. Gives us some idea of what it's like in different locales. It was in pretty good shape. Lots and lots of paint chips on the front. Came with a bra but wasn't installed when I bought it, though evidence of it being installed previously was there. This means paint that needs attention in the engine bay. Quite a few minor scratches throughout, but some paint correction should take care of that. Unusual finish on the window trim, but mechanically it was solid. It was originally sold in Virginia, and ended up in Massachusetts to the 2nd owner, who had it for only about 6 months before I bought it from him. He was a mechanic, and the car was tip top mechanically; new tires, brakes, oil change the day I picked it up. Already had a lowered suspension (H&R Race springs and H&R shocks), angel eyes, painted brake duct trim, black kidneys, HID fogs with yellow lamin-x, and came with splitters that I foolishly gave up to him in exchange for him performing the rear taillight ground fix on the spot. Purchased in northern Massachusetts (don't remember the town), currently residing in CT. Interior has quite a few scratches in the usual places (sunglasses holder lid cover, cup holders, trim around shift knob) and the alcantara bolsters on the driver's side was already nappy. Otherwise, the interior is excellent. Will need VANOS rebuild kit (seals and anti-rattle rings) and cooling system overhaul very soon. Purchased with 75,9xx miles. Last edited by az3579; 12-08-2010 at 03:40 AM. Options are Cold Weather Pkg, Xenons, Silver Cube and Gray Leather. I wasn't too crazy about the interior color but I don't mind it too much (although I'm very jealous of Marcus' tan interior haha). It also came with a clear bra already installed. At around 23,500 miles it already needed the VANOS fix (rattle can noise) but otherwise it has been great! Options: Xenons, moonroof, smoker's package, gray leather/black cube, Harmon Kardon w/phone and cd changer preparation. Car been through three owners before me, but has been in Daytona, FL all it's life. The exterior is a A08 (silver gray metallic) that is overall in good shape. A couple of cracks in the paint on lower front bumper, one dent underside driver door and minor scratches here and there. Nothing a good PDR and detail can't handle. The interior is N6TT (gray leather) with carbon fiber trim, besides the scratches in usual places, its in great shape. Basically stock besides tint. I found out a older woman had own the car the past 40k miles, and it seems she traded in it because of the common problems that were coming up. Which included tensioner noises (bad bearing), rear tail light harness melted, sunroof gets off track and it needed a brake job. I've ordered complete front and rear brakes, cooling system, and new VANOS seals as well. My budget is approximately $1500 to update maintenance including the common problems: rtab's, cab's, sunroof fix. . . considering I do it myself. Last edited by Linh; 12-07-2010 at 07:08 PM. 02/04 zhp sedan. Grey with black interior.114k miles. 14k. Xenon, hk sys. Beyern wheels. Bought it from my brother in law who owned it since it had 30k miles on it. He put 80k on it in less than three years. Almost all highway miles. It was also CPO, so he had everything done to it religiously. Bought in raleigh, nc. ^same production month and year FTW! 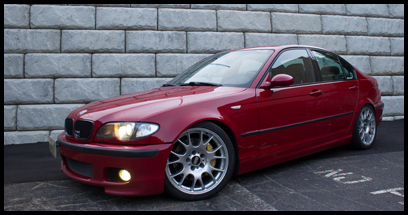 Options are ZHP, xenon, carbon fiber cube, Black Sapphire Metallic/black leather, leather wrapped wheel/shift boot. Whoever bought this from the factory apparently liked black.